This dressing is so delicious you will want to pour it on everything. 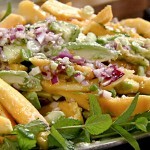 Layer salad with arugula and tarragon, then avocado, papaya and onions. Finally drizzle with vinaigrette. To a saucepan add orange juice, split vanilla bean and scrape seeds into juice. Add vanilla bean to juice, bring to a simmer and reduce liquid by 2/3. Meanwhile, smash garlic clove with a pinch of salt using flat side of a knife. Allow orange juice reduction to cool, remove vanilla bean, then add garlic puree, rice wine vinegar and olive oil. Stir well and season with salt and pepper.